Check Out the Community Development Ebooks! People who are active in their communities never seem to have enough time. Our community development ebooks series will bring you inspiration, more effective ways of reaching your goals, work-saving examples that you can adapt to fit your own situation, and sometimes a deeper level of information more specific than we can provide on the website. In 2019 we will be adding an ebook on starting a community development corporation and another on block units and their unique role in neighborhoods. For now, you'll have to content yourself with the first in the series, How to Start a Neighborhood Association: Hints on Creating a Process That Makes Sense for You. You can choose from a .pdf file you can download directly from this page at 2.99 USD, or a Kindle edition of the book, which of course you buy at their place at 3.99 USD. Content is basically the same, with the Kindle lacking in photographs but adding the social media policy sample and a couple of other tiny snippets. The newer cover at the top of this page goes with the Kindle version. 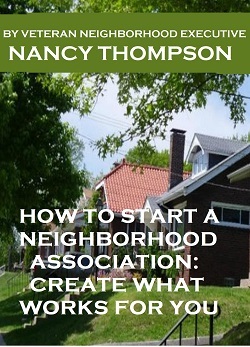 We know that if you want to start a neighborhood association, this would be the best community development ebook we could have completed first! When people come to the point of wanting a neighborhood association in their area, they want step-by-step directions. They are correct in thinking that many, many people have been down this path before and can share some valuable lessons learned. Most of us underestimate how different our neighborhoods are from one another. Each place offers unique assets and challenges. You wouldn't make this next mistake if you just thought about it a little bit. Consider that every person who might be involved along the road to creating a neighborhood association brings to the party a specific bundle of wishes, hopes, dreams, experiences, abilities, limitations, and relationships. Then you add in the number of relationships between pairs of people in your average neighborhood association start-up meeting. Let's say you attract 25 people to your first meeting, a respectable showing. That's 300 pairs of people, each of which might misunderstand, insult, or team up with one another. Wow. Now you understand why one size does not fit all when it comes to starting a neighborhood association, and why our 74-page pdf (or 115 Kindle "pages") still won't be some kind of miracle cheat sheet to how to make the project quick and easy. All we can say is that with the book, things will be quicker and easier than they would have been otherwise. Assorted other tidbits from our experience of working with many brand new neighborhood associations, as well as a few failed attempts. The cost is only $2.99, a really small price to pay to miss out on the aggravation of having to do some things over and over again to get them right. The samples alone are worth more. When we have substantial updates to offer, we'll send those on to you free. Of course there is a money-back guarantee. We don't think you'll be disappointed. Click that silly little Buy Now button below. Do You Need to Start a Neighborhood Association? We don't have anything more to say to convince you. This is your moment; don't blow it. 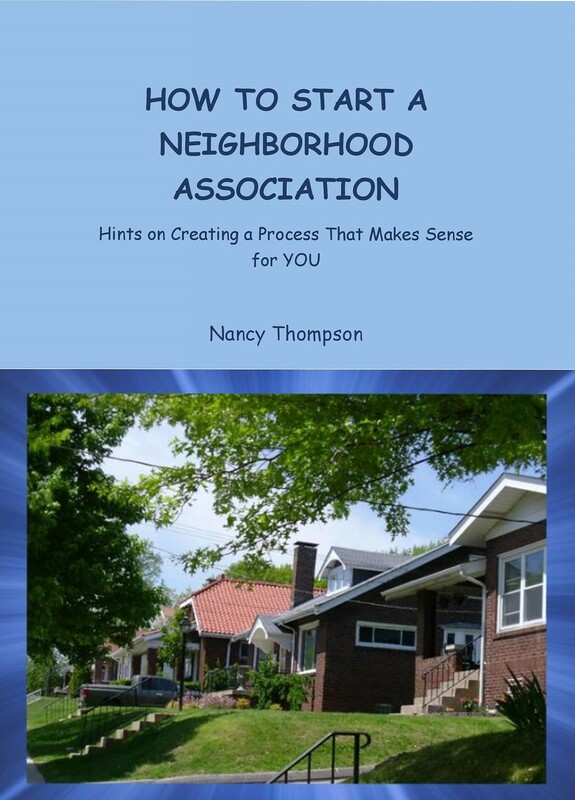 If you're even thinking about starting a neighborhood association, this humble little community development ebook, the first of several to come, will be your best friend. Don't waste time and effort, don't frustrate yourself and your family. Order your download now; it's only $2.99. If you prefer the other version, you can return to the top of the page to find the link.